The first lighthouse erected here in 1875 was a square cottage style screwpile design. It replaced a light at Fog Point on Cherry Island about a mile to the south that was built in 1827. The screwpile lasted for 18 years until January of 1893 when ice build up caused the structure to be bent over so that one side structure was in the water. In December of 1893 Congress allocated money for a new caisson type lighthouse. Work on the new light was begun in 1894 at the Lazaretto lighthouse depot in Baltimore. 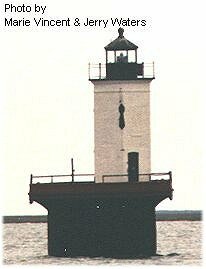 During the winter of 1894-95 the remainder of the lighthouse was destroyed by ice flows and took out the temporary lamp that had been displayed on the wreckage. By May of 1895 the caisson was completed and loaded on a barge to be taken to the site. It was positioned on May 20, 1895 and then sunk into the soft bottom of the bay. By June 30, 1895, the caisson had been filled with concrete to 6 feet above the water line and was ready for the keeper’s quarters and the light tower. A two-story wood frame keeper’s house was built with the brick light tower on one side of the eight sided building rather than in the middle. The light was first exhibited on September 30, 1895, with a fifth-order Fresnel lens. In 1919 the Solomons Lump fifth order lens was moved to Cherrystone light in Virginia and the fourth-order lens from Cherrystone was installed at Solomons Lump. In 1950 the light was converted to automatic operation and the Coast Guard keepers were reassigned. Soon after because of the danger of fire and vandalism the keepers quarters were demolished leaving only the tower on the caisson. The light is 47 feet above the water. It has a flashing white light with two red sectors. You can’t get there by car, only by boat or plane. The lighthouse is located about 6.5 miles from the nearest road and about eight miles from Crisfield, MD. It is located on the south side of Kedges Straits between the Chesapeake Bay and Tangier Sound.